I've been visiting my friends in Holland for a few days now and one of them was so kind as to grab me a precious bottle a month ago from the Amsterdam boutique. 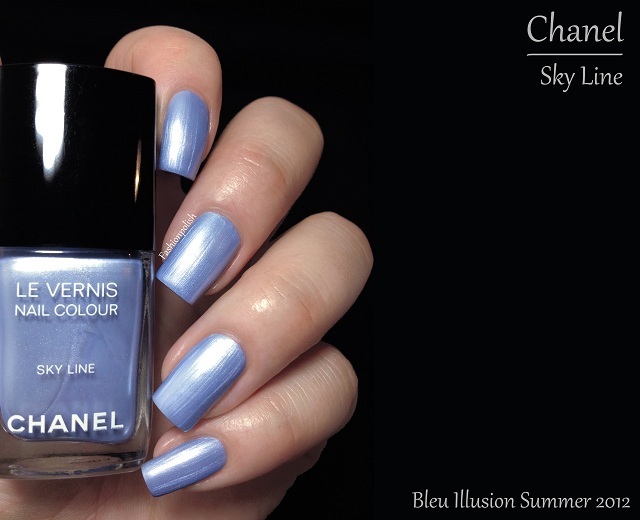 Sky Line is a metallic, leaning frosty, baby blue with a strong lavender tint. I seriously hoped for it to be a blue version of the now emblematic but sadly discontinued Chanel Silver but I found formula to be a disappointment, way to brushstrokey to appeal to me. While the brushstrokes tend to diminish with topcoat and actually don't look that bad in my swatches, in real life they appear more visible. This is two coats with topcoat. I still think this is a beautiful swatch. Surprised Chanel haven't polished the finish! I totally agree with you conclusion! It's a pretty color, but the finish (lines) should be better. I still want this baby :) The color is fantastic, Sam! 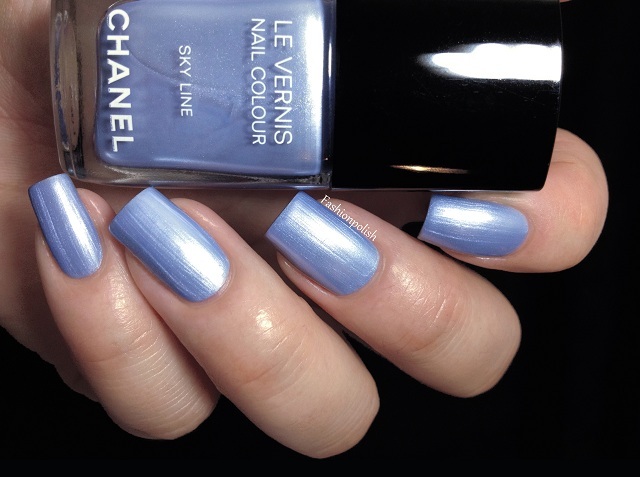 I´ve read this kind of polish, which leaves brushstrokes, looks great and better with matte top coat. Did you try, Sam? Bisous - wish you´re having a wonderful time in Holland!!! I also agree with you. the color is gorgeous but I'm a bit scared of the finish...at least, it looks super pretty on you! I have them and I love them! This is such an amazing blue, but I have to agree as well. Just too brushstrokey, especially for the price. I'm not a frosty finish fan...but this is very pretty! Have fun in Holland! I spent 6 months in Maastricht in college...fond memories! A little streaky but I'd still welcome it into my collection because it's such a lovely blue! Too frosty for me to fork out the Chanel $'s. I also don't look good in any light blues I have worn - gives me either lob. hands or look like I am really ill. Very pretty! But I won't be buying it. It's now available at chanel.com in the US store. That's new as of today.